Are we ready? “All things are ready,” we are told. Ready for what? What does it mean to be ready for the banquet, for the wedding feast? And what is the wedding garment which seems to be so necessary such that without it we are cast out just when we think we are safely in; indeed “cast into outer darkness” where “there shall be weeping and gnashing of teeth”. Not exactly a pleasing prospect. The times are never so bad that a good man cannot live in them. “The days are evil,” St. Paul reminds us, and yet he bids us “be ye not unwise”. The quality of the times in which we live cannot be the measure of virtue and character. The times in which we live are rather the setting in which virtue is shown and character is proved. The question for Christians “at all times and in all places” is whether we will be defined by circumstances or by grace. By grace, we mean the highest perfection of human virtue which is God’s work in us and for us, come what may in the world around us including the sad parade of our own sins and follies. One thinks, for instance, of St. Augustine, dying in his Episcopal see of Hippo Regius in 430 AD, even as the armies of the Vandals were besieging the city, about to obliterate what had been the work of a life-time in the formation of Christian souls and the development of a Christian culture. It was the first of a series of invasions that would virtually obliterate any trace of North African Christianity. It was to survive principally in the writings of its theologians, chief of whom was Augustine, whose writings would contribute greatly to the shaping of Europe. Or one thinks, perhaps, of a Dante, cast out of his beloved city of Florence and into the dark wood of exile. And yet, in spite of his exile, or, perhaps, because of it, he produced the greatest epic poem of Christian pilgrimage of all times, The Divine Comedy, “to lead those”, as he says, “in a state of misery to the state of felicity”. Artwork: Caspar Luyken, The guest without a wedding robe is thrown out, 1712. 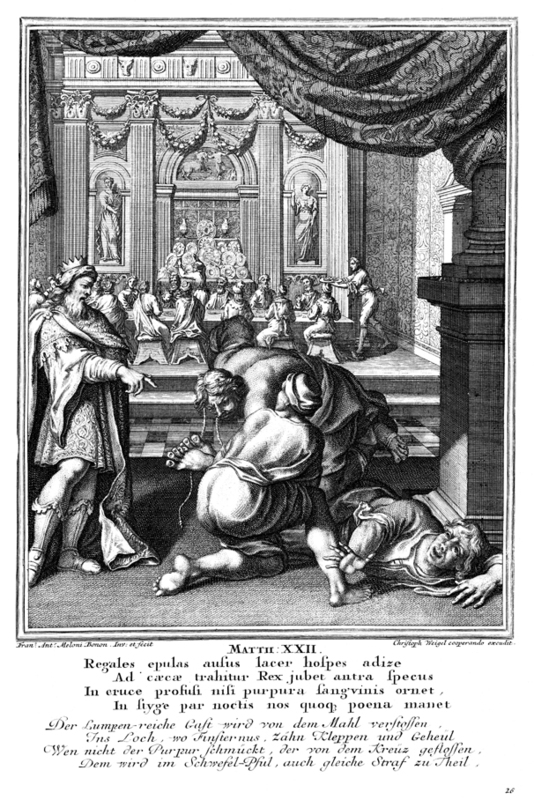 Engraving, Bowyer Bible. In the various New Testament lists of the Twelve Apostles (Matthew 10:2-4; Mark 3:16-19; Luke 6:14-16; Acts 1:13), the tenth and eleventh places are occupied by Simon and Judas son of James, also called Thaddeus. To distinguish Simon from Simon Peter, Matthew and Mark refer to him as Simon the Cananaean, while Luke refers to him as Simon the Zealot. Both surnames have the same signification and are a translation of the Hebrew qana (the Zealous). The name does not signify that he belonged to the party of Zealots, but that he had zeal for the Jewish law, which he practised before his call. The translation of Matthew and Mark as Simon “the Canaanite” (as, e.g., KJV has it) is simply mistaken. 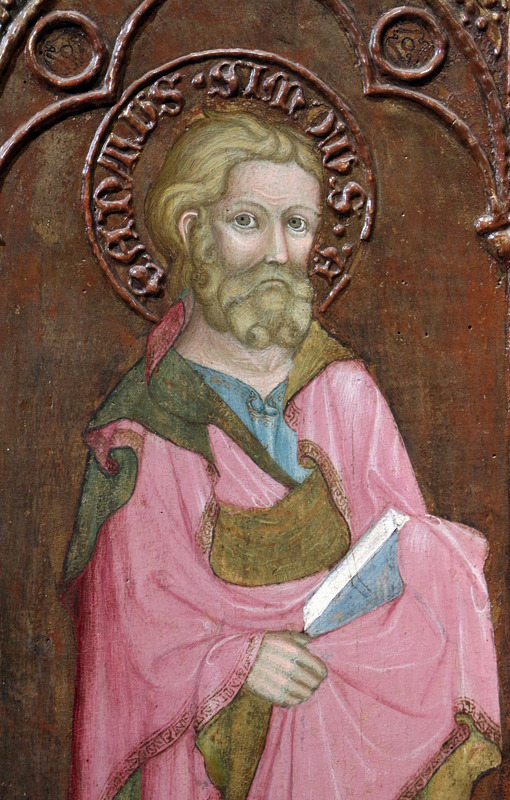 The New Testament contains a variety of names for the apostle Jude: Matthew and Mark refer to Thaddeus (a variant reading of Matthew has “Lebbaeus called Thaddaeus”), while Luke calls him Judas son of James. Christian tradition regards Saint Jude and Saint Thaddeus as different names for the same person. The various names are understood as efforts to avoid associating Saint Jude with the name of the traitor Judas Iscariot. The only time words of Jude are recorded, in St. John 14:22-23, the Evangelist is quick to add “(not Iscariot)” after his name. With the story of Abraham, Genesis moves from the mythological to the historical. With Abraham we step into history, as it were. This raises interesting questions about how we think the Scriptures. Many atheists and many fundamentalists, for instance, have the same problem in their approach to the Scriptures, namely, reading them literally and failing to note what they mean philosophically. Aristotle notes that poetry is more philosophical than history but that doesn’t mean that history is not philosophical or that there is no philosophy both in and of history. After the great poetic and philosophical account of creation in Genesis 1-2, the text considers the Fall of humanity. Along with the consideration of how we are being called to account – the positives of the story of the Fall and its aftermath – Genesis is at pains to show how humanity, when left to its own devices, is pretty deadly and destructive. The story of Cain and Abel lead, ultimately, to the story of the Flood as an illustration of what ‘freedom without order’ means; namely, violence and death. The Flood is the divine response to clean up the mess that arises from human wickedness and to place our humanity and the creation as a whole upon a new foundation; the new foundation of God’s covenant signalled in the sign of the rainbow. We are reminded of God’s commitment to his creation and in so doing, too, we are reminded of our commitments to God and to one another. It is, however, always a matter of education. Freedom without order contrasts with order without freedom which is seen in the story of the Tower of Babel in the attempt by humans to impose one language and one way of thinking and acting upon everyone. Shades of totalitarianism. It stands in direct contrast to the divinely created world in which there are diversities of cultures and languages. These mythological sections of Genesis then pass over into the historical, commencing with Abram who is renamed Abraham through his encounters with God. God’s covenant with Abraham is about the promised land and the promised son. They, in turn, belong to the powerful idea that through Abraham “all nations of the earth shall be blessed”. In other words, we arise to the idea of a universal principle through the particularities of culture and language and not at their expense.